For more info including footage from a 1994 episode of falling Walruses see Susan Crockfords site. h/t to Pat, GWPF, Steve Hyland and George. Words fail me, as they do increasingly these days. How many more heads and tentacles of the monster have we to cope with? It has the nature of evil. Exasperating is a good word, when something is wrong its just that, WRONG. Hi Annie, Any chance of a quick Brexit update from someone “on the ground so to speak” ? Not much reported on in Oz . I’ve been on the move again Sambar. The situation is past belief re. Brexit and there is huge anger. It’s too complicated to write about now as I am way past my bedtime after sitting up enjoying a lively thunderstorm. Thanks, and sympathies to all poms who used to believe in DEMOCRACY. I suppose we could welcome them here in the colonies while there is still a chance. Are you insinuating that a cuddly polar bear has no empathy with its food? Send in the vegans! They’ll sort it. ….currently the Svalbard walrus population is growing at a rate that matches the theoretical maximum rate of growth that has been calculated for recovering walrus populations under favourable environmental conditions with no food limitations…. …….So it was naughty of Blue Planet II, in showing a sequence in which a mother and calf walrus desperately try to find a bit of ice big enough to bear their weight but not already occupied by other walruses, to imply that this was evidence of climate change threatening a species with extinction. Most of the ice in the Arctic Ocean disappears each summer and reappears each winter. Walruses have hauled out on shore, or on what’s left of the ice at that season, forever. The main thing that has changed is that there are now more walruses, and more polar bears feasting on them, throughout the Arctic. If nature was so fixed in stone that everything was ‘MEANT’ to be a certain way, there would be no life on earth. Walruses are not meant to be anywhere/do anything rigidly, they will exploit whatever opportunities come their way, and adapt to whatever circumstances are thrown at them – this is the driver of evolution of behaviour and of species. Would a polar bear ignore a washed up whale carcass because it was meant to be hunting seals? The complete lunacy of the climate alarmists is evident in the way they twist everything into a negative and ignore facts that don’t fit the narrative. So polar bears that are supposed to be extinct because they can only survive by hunting from ice, but they are hunting on land here – that’s an awkward contradiction. And surely Walruses hauled out on snow free beach terrain stand a much better chance of seeing a white bear stalking them? So generally, rather than in one off circumstances, it would be a better survival strategy? Well that’s more logical than their ice-gone doomsday contrivances anyway. Oh, so back 25 years ago it was deemed natural by the experts. Main feature ‘Attenborough and The Art Of Lies’ later. How much will be Attenborough’s BBC Golden Handshake? How much would it be If it was not so tied to Wind Farm Economics? The whole world is like some kind of “Tale of Two Cities”. The internet lasts for ever & will supplant Mme Defarge’s Coded Knitting. There is no problem in the Southern Hemisphere. No Polar bears. No penguins in the Northern Hemisphere either. However at the average maximum temperature is 0C at the North Pole in summer, the ice extent varies dramatically from -0.1C to +0.1C. This is nothing new. Everything is forced to land but there are massive migrations north as well by many species to enjoy the midnight sun and the new short term crops. Now we are told the annual warming is a disaster for walruses and Polar Bears. What about all the other species? Also when are the species going to have their young? An eternal frozen cold is not ideal for any species but yes, animals which live on ice have a hard time in the summer. This is all fake news, like the Walt Disney special which won an academy award for depicting the lemmings going over a cliff. “All our environmental problems become easier to solve with fewer people, and harder – and ultimately impossible – to solve with ever more people.” – Sir David ‘Eugenics’ Attenbollocks, Population Matters patron. From the voiceover on Disney’s 1958 fauxumentary – “A kind of compulsion seizes each tiny climate activist rodent and, carried along by an unreasoning hysteria [ie. 97% settled science], each falls into step for a march that will take them to a strange destiny.” I’m flying… SPLAT! Add it to the list…. 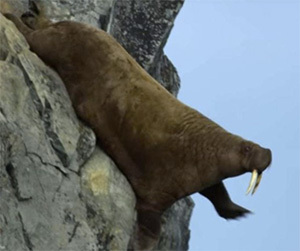 Or…..walruses turn into lemmings during climate change…you just couldnt make this stuff up…. But it was the start of the acceptability of lying in ecological documentaries because it made an award winning story. The first major faux documentary, a faux fact turned into a supporting film with faked scenes which were much cheaper to film. Even a plausible explanation. All presented as credible, factual natural science supported by video. Then you get the “Inconvenient Truth”. As people moved away from fact based rational science to fantasy and emotion, the truth is lost. David Attenborough as presenter trusts the people informing him. Nothing more. Uh oh we have a problem. Well most observations of these Halouts were on beaches,but it this case it appears they ascended to a cliff top frrom a beach.Being big,slow and lazy when their mass is nor supported by seawater I find it difficult to believe these animals would make the extreme effort of climing such acliff – unless they were pursued. I doubt the veracity of the the film makers. No. Lewis published in 1871. The sea in 2019 is clearly not boiling hot. Ergo the oceans have clearly cooled. The real danger Now is that the idiots in the climate change movement will drive our western civilisation over an economic cliff. Just remember, Mal – they are not idiots, they are very smart and compassionate people. When they plunge the world into a dystopia they will be the least able to adapt. …as well as a plan to divide up their possessions and re-purpose their lands. Are these the arctic version of drop bears? And the obvious question – with 20,000 flying off to Climate Conferences every year for the last 15 years (or more), why aren’t polar bears extinct? Obviously every jet drops one Polar bear over a city. They should stop that. Besides the open country side is far less dangerous. Maybe the occasional Polar bear would land in a haystack. Just trying to help. Being in my 70s my memory isn’t what it used to be; but somewhere in my memory bank is a picture/story of a seal faced with a life or death decision. Men were tromping around on the shore near the seal and orcas were swimming in the water just offshore. The seal chose to dance with the men rather than splash with the orcas. If when faced with a slightly different choice, orcas versus polar bears, walruses opt for dancing with polar bears, we have a solution to the problem of cliff-diving walruses: simply encourage a few orcas to swim in the water near the cliffs–or even better, build a bunch of orca dorsal fin look-a-likes and float them in the water. David Attenborough should be elated because we’re helping to feed the starving polar bears. A very pragmatic comment Reed. Poor old David Attenborough. He really has lost the plot. I used to admire him once but feel sorry for him now. It is unfortunate when people don’t know when to bow out gracefully. I put this one in weekend unthreaded, it’s worth repeating. A line from a news item about the latest David Attenborough series. “The starting point was that we wanted to illustrate, through natural phenomena, climate change and that the arctic is increasingly warming,” Keith explains. “And the next thing was, ‘Right we’ll do a calving glacier’. …. killed by falling walrus, insufficient OH & S & PPE. I suppose that Addledborough need every penny from Netflix he can, now that he has dementia as well as not being able to walk & actually see what he is asked to talk about. in the “natural’ world..
David Attenborough certainly scurries about making pronouncements as if he knew what he was talking about. If I wanted someone who would feed the public whatever I tell him to and I wanted to be certain he wouldn’t look into what I’m telling him and discover that I’m wrong, he would be the perfect choice. Instead of believing any of these doom and gloom people why not interview a walrus? But then Jo has essentially done that and there is the poor climate change decimated polar bear in such numbers as to be a predator among the walruses. I’d jump off a cliff too if I had a polar bear behind me bent on eating me for lunch. “In his narration, Sir David said that this was the result of declining sea-ice levels caused by global warming. Many years ago I spent a week on Round Island in Bristol Bay, which is a major “haul out” island for walrus. There were hundreds of them along the shoreline. Hauling out is something walrus do after their long excursions to their feeding grounds. Also male walrus tend to spend most of their lives in ice free waters. They only go up into the icy areas, where the females tend to hang out, to mate. It appears like the footage used was the episode in Russia – Too many “I”s were dotted and “T”s were crossed. It could be called a very successful polar bear hunting expedition. But what is really disgusting is that the desperate warming crowd, have taken advantage of a 94 year old icon to spread their trash.